There are times when it's great to go all out and make a mess, like when you're painting, or food fighting, or if you're Mr. and Mrs. Love, nine months before the birth of Courtney. This is one of those times: SJ Crawfish. Bizarrely part of a chain that boasts locations in San Jose, Sacramento, and Ho Chi Minh City, SJ's a deceptively big seafood shack (decorated with kitschy nets and buoys) where gettin' messy's the name of the game, which is why their grub's served on paper plates and their spartan wooden tables're covered in butcher paper and stacked with paper towels, i.e., scratch those off your Costco list...Thanks SJ! 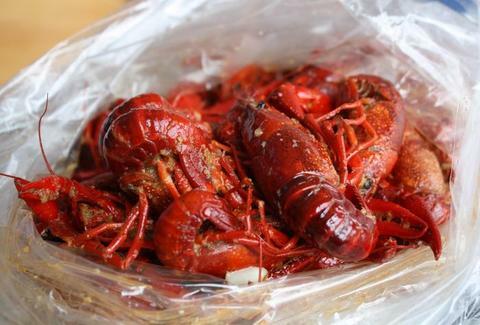 Even though it's all about the crawfish -- succulent big boys from Louisiana that're served in 1-lb bags with hot garlicky oil -- they've also got Dungeness and Alaskan King crab, which you can get steamed or Cajun-style, but not Ragin Cajun style, because no one wants to eat James Carville. Beyond that, there's a nice list of fried offerings that includes soft shell crab, oysters, salty shrimp, buffalo wings, chicken nuggets, calamari, and lobster balls, which for them, truly are The Deadliest Catch. You will need beer, and there are five or so standard bottles to choose from -- just don't have too many or you could find yourself behaving like a 'hole.